The two-place T-33 jet was designed for training pilots already qualified to fly propeller-driven aircraft. It was developed from the single-seat F-80 by lengthening the fuselage slightly more than three feet to accommodate a second cockpit. Originally designed the TF-80C, the T-33 made its first flight in March 1948. Production continued until August 1959 with 5,691 T-33s built. In addition to its use as a trainer, the T-33 has been used for such tasks as drone director and target towing, and in some countries even as a combat aircraft. The RT-33A version, reconnaissance aircraft produced primarily for use by foreign countries, had a camera installed in the nose and additional equipment in the rear cockpit. The T-33 is one of the worlds best known aircraft, having served with the air forces of more than 20 different countries for over 50 years. Many are still in use throughout the world. Experts-Choice released this set about a year ago covering T-33As used by ADC as unit hacks or as threat aircraft for exercising fighter interceptor squadrons. Color and register on my set are excellent and most of the smaller text on the stencils is legible. Few maintenance stencils are included however and will have to come from kit sheets or other sources. The instructions and drawings are well done and specify small differences (pitot tubes, navigation lights, stencils, etc.) in each of the four aircraft. 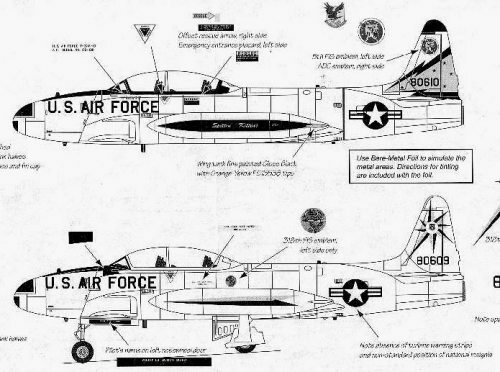 Three aircraft are said to be Block 15 T-33As but I’ve never found a reference to any T-Bird block above 5. The recommended kit is either the Academy or Hobbycraft T-33A in 1/48 scale. Four Fighter Interceptor Squadrons are represented. All of these squadrons flew the F-106 Delta Dart during the periods covered and their T-33s were usually painted to match their Darts. First is an overall natural metal T-Bird from the 94th FIS out of Selfridge AFB, MI in 1968. Next is an 87th FIS hack from 1975 painted in overall ADC gray (FS16473.) The 87th was based out of K.I. Sawyer AFB, MI. Also in a highly polished, overall natural finish is a T-33A from 1977 the 5th FIS flew out of Minot AFB, ND. Lastly is a McChord AFB, WA based 318th FIS T-Bird painted again in glossy ADC gray. This aircraft, from 1982, has Air Defense-TAC markings as the ADC was disbanded in 1979 and the remaining FISs fell under TAC. Here is that same plane four years later in 1982. Note the difference in markings. One small detail I noticed on the 5th and 87th tail decals is they do not cover the small, trailing edge rudder extension on the T-33As. This will have to be painted to match the respective decal. Also note that many squadrons (the 318th I specifically remember) often had T-33s painted ADC gray or remaining in natural metal at the same time but used the same colorful markings on both versions. 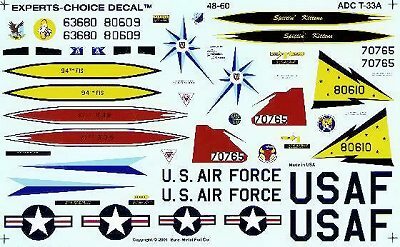 Overall I recommend this set as a neat companion to your F-106 collection as all of these squadrons have matching decals for the Dart. If you would like your product reviewed fairly and quickly by a site that has over 150,000 visitors a month, please contact me or see other details in the Note to Contributors.